You are here: Home » Special Sections » Senior Services » How can they keep from singing? Several months ago, 15 members of the Basilica of St. Mary choir filled Mary Sue Dobbin’s St. Paul living room with the sound of Christian songs and hymns. It wasn’t a social gathering or prayer service but rather a visit meant to encourage healing and peace through song. Representing the Basilica’s Threshold Singers ministry, Basilica choir members volunteer to sing hymns and songs to parishioners and their loved ones and friends who are dying or living with serious illness. 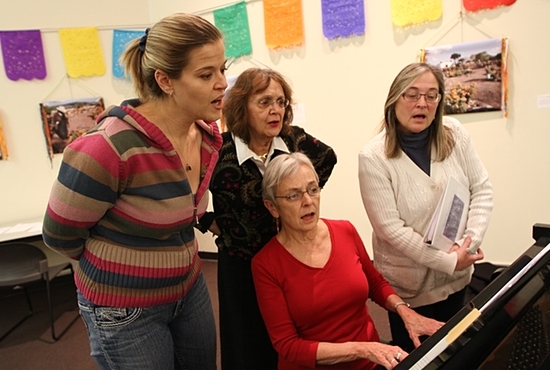 Recognizing the power of music to connect and move souls, groups of two or more Basilica Threshold Singers visit the sick and dying in their homes, hospitals, hospices or nursing homes and sing for up to 30 minutes in unison, solo or harmony. One of many threshold singing groups nationwide, the Basilica’s ministry is unique because it focuses primarily on sacred music and hymns, according to Teri Larson, choral music director. The Basilica Threshold Singers is a new ministry that very few communities are able to offer, said Cathy Edwards, caring ministries coordinator. The idea for the ministry developed as parishioner and choir member Ruth Gaylord spoke with Larson last year. Gaylord experienced threshold singing when she suffered from ovarian cancer 13 years ago and also with a dying friend. Larson and Gaylord decided that the ministry should involve the Basilica’s 90-member choir. Half the choir members have expressed a desire to participate. “It’s kind of been thought of as an outshoot of the Basilica choir because we’re already there rehearsing this body of people that knows some repertoire, and so we’re trying to start with that,” Larson said. As of 2012, there were roughly 100 U.S. and Canadian chapters of the Threshold Choir, a network of primarily women’s a cappella choirs who “sing for and with those at the thresholds of life.” Threshold Choir, established in 1990, is not sectarian. The Basilica Threshold Singers, on the other hand, focus on Christian music, such as simple hymns, and refrains by the Taize Community and liturgical composer John Bell, Larson said. The time when someone is gravely ill or near death is sacred, Larson said, and friends and loved ones often don’t know what to say. Music can bring something to those moments, Larson said. With their gift of song, the Basilica Threshold Singers hope to comfort and connect hearts, Gaylord said.